In my previous blog post about the inductance of some decoupling layouts, I concluded that using two 0402 capacitors would (almost) always be a better choice than using one 0306 capacitor. Andrew commented that mutual inductance might have an effect and he wanted to see measurements of layouts where two 0402 capacitors were present. Fortunately, my test layout supports that and I have now made a few extra measurements to see how two 0402s in parallel actually performs. Here is a picture of the top side of the layout with the relevant components in color. For more details about the layout see the previous blog post. Top view of the layout, including the shape of the power plane. Footprints not discussed in this blog post are grayed out. C110 and C117; two 0402s close to each other (but connected in reverse) taking up roughly the same area as one 0306. C110 and C112; two 0402s far from each other and thus without inductive coupling. The same cases as above but on the bottom side of the PCB and thus further from the planes. I also include old data for the 0306 at position C132 for comparison as well as data for the single 0402 at C112. Case 1 might give some inductive coupling between the components and vias, especially on the bottom side where the vias are longer and the capacitors are further from the planes. The coupling should help reduce the inductance since the currents in the nearby capacitors and vias flow in opposite directions. 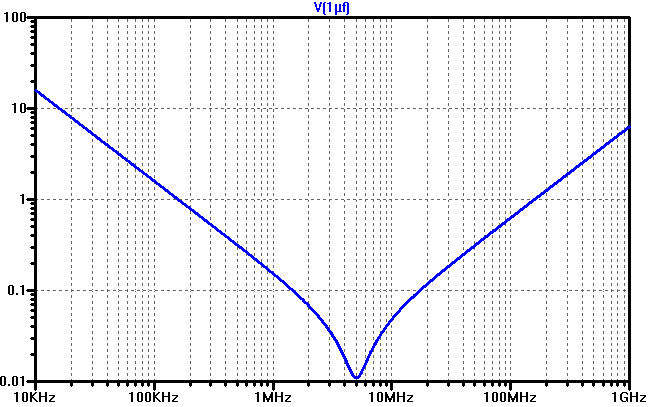 Here is an impedance plot comparing the impedance of one 0306 to that of two 0402s on the top side of the board. Impedance of a 0306 capacitor (blue) compared to impedance of dual 0402 capacitors (red). Below is the table with the results of the measurements. Layouts E and G were presented in the previous blog post whereas I and J are new. In both cases of dual 0402 layouts, the inductance was less than the inductance of the best 0306 layout, just as predicted. The two 0402 that were placed close together had a slightly higher inductance on the top side than the other variant, despite the inductive coupling that should help reduce the inductance. Maybe this is measurement error or maybe the result is caused by differences in plane imperfections (anti-pads) close to the capacitors. Or perhaps it is the result of that the current going to both capacitors flows in the same part of the planes, whereas current flows in different parts of the planes when the capacitors are far away so that the plane inductances appear in parallel. If the latter is the main reason for the difference in top side inductance, the fact that the bottom side inductances came out the same might be explained by the additional plane inductance being offset by the reduction in inductance caused by the inductive coupling between the (long) vias and the components that are far from the planes. The inductive coupling is likely to have a bigger effect on the bottom side since the vias are longer and the capacitors are further from the planes. So, the prediction from the previous blog post that using 0402s is a better idea than using half as many 0306s holds up well. I recently published the results of measurements of the inductance of a few different decoupling layouts. 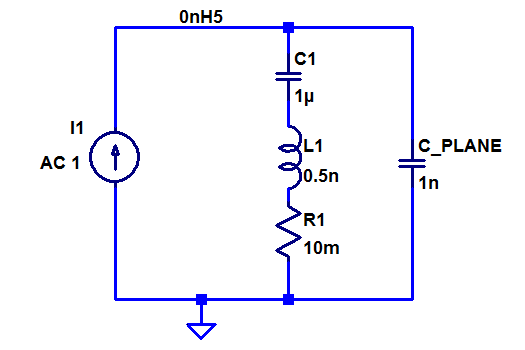 This post gives the theory behind why it is desirable to keep the inductance very low. Model of a decoupling capacitor and its associated layout. The impedance (in ohms) vs frequency of a 1 µF capacitor with 1 nH of series inductance and 10 mohm of series resistance. The left straight part of the V is where the capacitive reactance dominates. Here the impedance is halved for every doubling of the frequency. The right straight part of the V is where the inductive reactance has taken over. Here the impedance doubles for every doubling of the frequency. The lowest part of the V is where the capacitive and inductive impedances are equal and of opposite sign so that they cancel and the only thing maintaining a non-zero impedance is the series resistance. This is where the capacitor is series resonant and therefore as efficient as possible in performing its decoupling function. 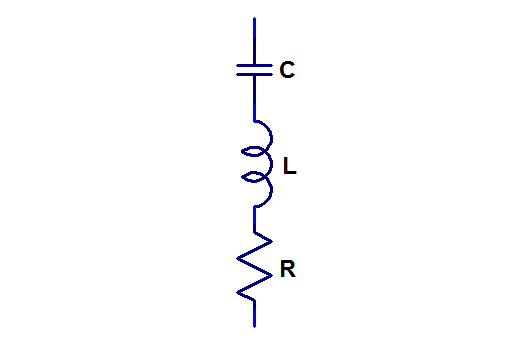 If the resistance is lower than the intersection of the extended straight lines from the inductive and capacitive parts of the curve, the lowest part of the curve will dip down deep, like in the plot above. This is typical of ceramic capacitors. If the resistance is higher than the intersection, the lowest part of the curve will be a horizontal flat region above the hypothetical crossing of the straight lines. This is typical for electrolytic capacitors. 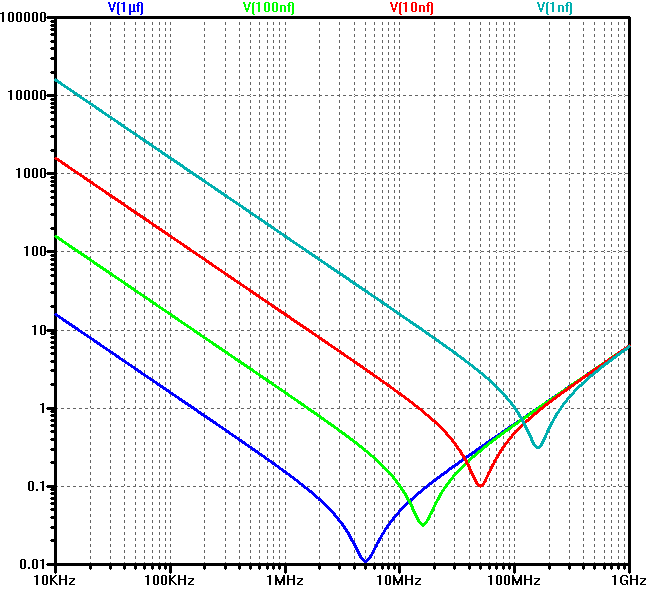 Below is a plot of the simulated impedance vs frequency for four different capacitors. All have the same series inductance (1 nH, which is typical for a reasonably well laid out 0402 capacitor). Note that except for the area around resonance, the lower value capacitors are never better than the higher value ones, so even if a 1 µF capacitor has a resonance frequency of 5 MHz, it is better (has a lower impedance) than the 1 nF capacitor (which is resonant at 160 MHz) for all frequencies up to 100 MHz and the 1 nF capacitor is only a little better in a relatively small region around its resonance frequency). Impedance vs frequency plots for a few capacitors with different capacitance (1 µF, 100 nF, 10 nF and 1 nF) but same size and therefore same inductance. Since the inductance dominates the total capacitor impedance for such a large range of interesting decoupling frequencies, it is important to keep it as low as possible. It is also important for another reason, namely that troublesome parallel resonances are formed when paralleling capacitors of different characteristics and that the amplitude of the parallel resonances is highly dependent upon the inductance. The planes have a relatively small capacitance, and therefore there will always be at least one parallel resonant peak when decoupling capacitors are attached to a plane. The equivalent circuit (valid up until frequencies where the plane starts to show its own resonances due to its distributed nature) of a decoupling capacitor and a plane is shown below. Equivalent circuit of a decoupling capacitor connected to a power/ground plane pair. Below is a plot of the total impedance of a 1 nF plane capacitance in parallel with a 1 µF decoupling capacitor with 0.5 nH (blue), 1 nH (green), 2 nH (red) and 5 nH (blue-gray) parasitic inductance. As can be seen, the inductive parts of the curves are higher for the higher inductances and also the parallel resonant peaks are higher in amplitude and lower in frequency when the decoupling capacitor has a higher inductance. Impedance of a 1 nF plane capacitance in parallel with a 1 µF decoupling capacitor with 0.5 nH, 1 nH, 2 nH and 5 nH series inductance respectively. 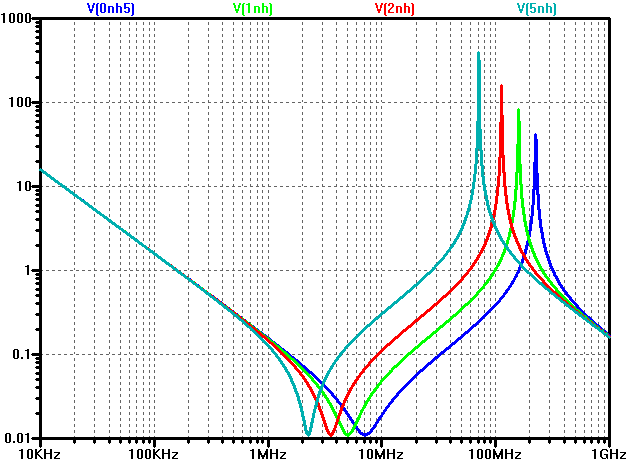 Higher inductance gives higher peaks at lower frequencies. So it is apparently a good idea to keep the inductance of the decoupling capacitors low. Since surface mount capacitors are essentially just small rectangular blocks without leads, their inherent inductance (although strictly not so well defined) is rather low and the PCB layout (PCB tracks and vias) can and does add significantly to the total inductance of the capacitor. It is therefore of interest to know what impact different layouts have on the inductance and in order to put somewhat hard numbers on different layouts, I designed and measured the test board described in the previous post. In 2008 I made a test board and did a series of network analyzer measurements to determine the effect of the layout on the inductance of decoupling (bypassing) capacitors on a multi-layer PCB. The results were published in Elektroniktidningen and on axotron.se (in Swedish, although the table with the important results is probably possible to understand even if you cannot read Swedish). I have now built and tested a new test board with a new set of decoupling capacitor layouts and this time the layout includes both via-in-pad and reverse geometry (broadside) 0306 capacitors as well as normal 0402 capacitors. This blog post describes the new results. The new test layout resides on a corner of an 8-layer board. It consists of identical layouts on the top and bottom while the power plane is located much closer to the top than to the bottom. In this way, the effect of via length can be tested. 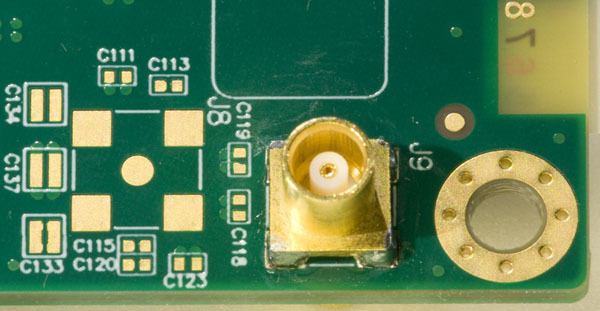 There is a surface mount coaxial MCX-connector on the top of the board and right under it is another MCX-connector. The signal pins of the two connectors are connected through a via that also connects to a minimal power plane inside the board. The ground pins sit on top of several vias that connect to the ground plane inside the board. Overplated via technology is used, so it is allowed to put vias directly in the pads of the components without any risk of solder being sucked away from the pads. There is also another pair of MCX-connectors on the board. They are identically connected, except that the signal via goes straight through the PCB without connecting to any plane. This is for performing the thru calibration of the network analyzer (VNA). It allows the VNA to subtract out any parasitics and the delay associated with the connectors and vias so that only the effects of the plane and the capacitors are measured. Below is a series of pictures illustrating the layout and stackup. Stackup of the 8-layer test board. 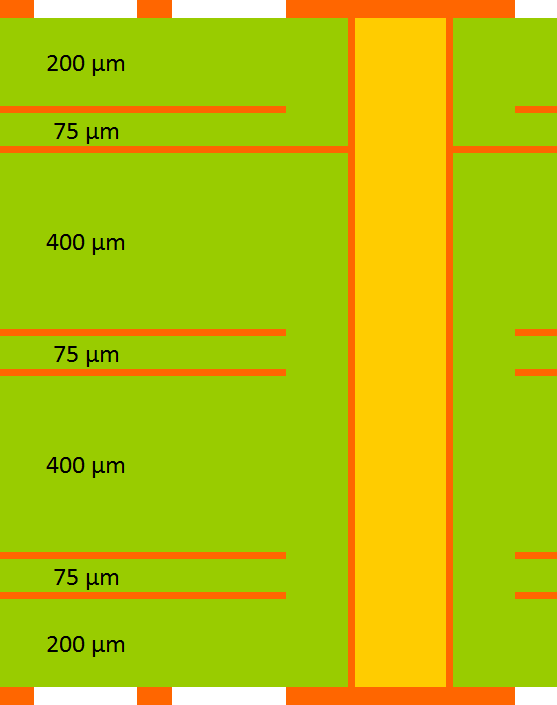 The distance between the power and the ground planes is nominally 75 µm. The distance from the power plane to the top is ~300 µm and the distance from the power plane to the bottom is 1200 µm. Photo of a cross section of the PCB showing the copper layers. Top view of the layout, including the shape of the power plane. The layout on each of the eight copper layers. Layer 2 is the ground plane and layer 3 is the power plane. The other inner layers are not connected to the test circuitry. To measure the inductance, a vector network analyzer (VNA) is used. Theoretically, one could connect just one cable and measure S11 (essentially how much of the incoming wave is reflected back to the VNA) but this method is not so stable when measuring really low impedances (relative to 50 Ω) and calibration is also a problem, since one would like to measure the impedance right at the power plane. Therefore S21 is measured, i.e. how much of the incoming wave passes through to the other MCX connector. With this method it is easier to do the calibration and the results are much more reliable for impedances much lower than 50 Ω. 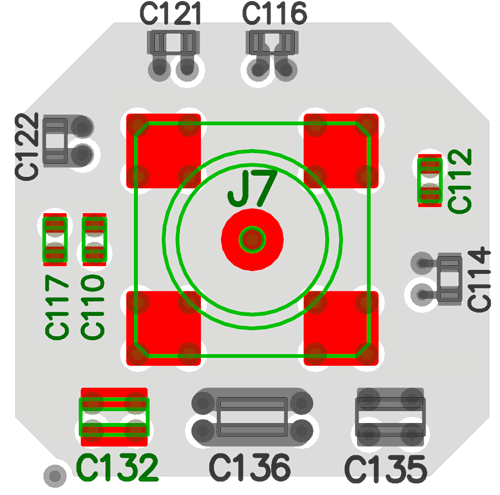 The use of S21 is the reason for the two connectors on opposite sides of the board as well as the pair of thru calibration connectors. If the plane capacitance is small compared to the capacitance of the decoupling capacitor (and the parasitic inductance is not too small), there is a frequency range between the series resonance (of the capacitor) and the parallel resonance (between the plane capacitance and the inductance of the capacitor) where the inductance of the capacitor dominates. This is where it is easiest to deduce the inductance of the capacitor and its layout. To further improve the inductance measurement, S21 of the plane was first measured and converted to shunting impedance. This impedance was then mathematically removed from the impedance of each capacitor/plane combination (by treating it as being in parallel with the capacitor impedance). This correction is small for frequencies below 100 MHz and only results in a few percent change in the calculated inductance. The effect on the impedance for a typical case is shown in the plot below. 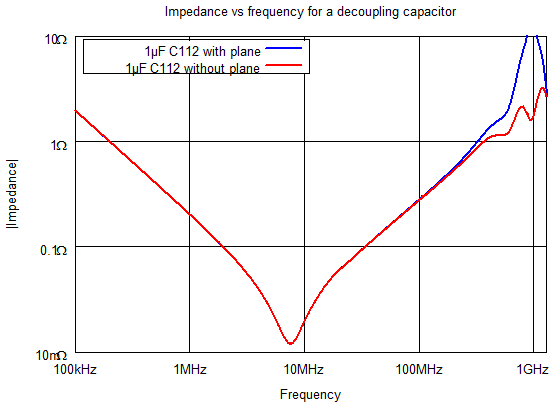 Impedance vs frequency of a 1 µF 0402 capacitor at location C112. The impedance contributed by the plane has been mathematically removed in the red curve, but not in the blue. Only one capacitor at a time was mounted on the board and then S21 was measured. This allowed calculation of the inductance of each of the different decoupling layout variants. 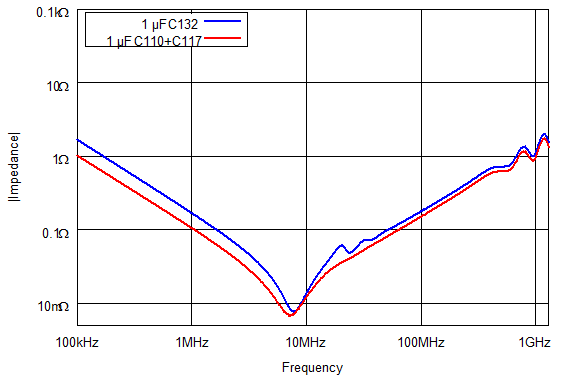 The frequency 100 MHz was chosen as the point where the inductance was evaluated. The reason for this is that it is close to the geometric mean between the series and parallel resonances. It turns out that the inductance value one obtains is slightly dependent upon the selected frequency. The value decreases by about 4-8% from 30 MHz to 200 MHz, but this amount of uncertainty is probably smaller than the uncertainty caused by factors such as capacitor placement tolerance, board layer thickness variation and general measurement tolerance. Below is the table with the results of the measurements. Eight different layouts were tested and the inductance was measured on both the top and the bottom side of the board. Layout A is similar to Layout H in the tests I did in 2008, which showed 0.78 nH/1.05 nH top/bottom inductance. 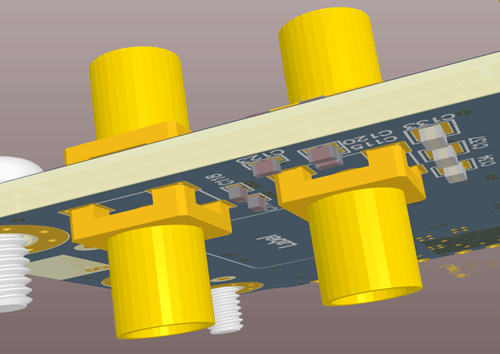 The new layout shows lower inductance for the top side, but higher for the bottom side, despite the similarities. The different results may be the result of subtle differences in the test boards. The most important ones are that the previous test board had ground planes on layers 4-7 in addition to the main ground plane on layer 2 and that the previous test board had 0.2 mm spacing between all layers, whereas the new board has 0.075 mm spacing within the power/ground plane pair. The smaller plane separation means that the power plane is closer to the top (lower inductance on the top side and higher on the bottom side) and the additional ground planes on the previous test board provides additional paths for the ground current through the other ground vias and that reduces the inductance. These layout differences might account for the differences in inductance. Layout B is slightly better than layout A as expected due to the wider traces. The effect is small but worth while since wider traces do not cost extra. The improvement might in fact be partly obscured by a somewhat unfortunate layout. The power plane close to the power via of C121 has more holes cut in it than around C114. 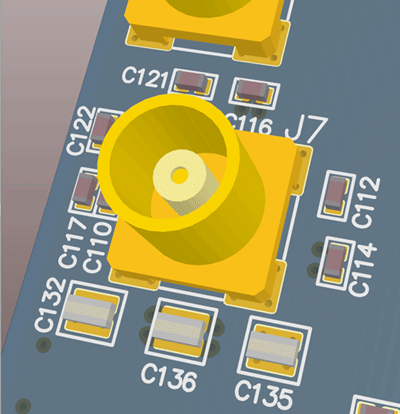 The extra holes increase the inductance. Layout C shows that keeping the tracks closer together might give a small advantage. This layout (C116) is less affected by MCX ground vias than C121, so at least part of the improvement over layout B might be attributable to the more solid power plane close to the power via. Layout D with even wider traces than layout B gives a (very) small improvement. 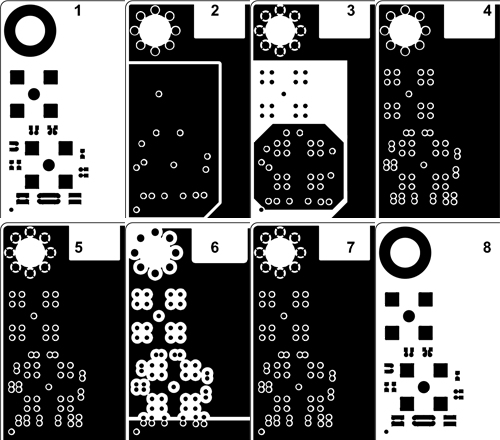 This layout is also affected by nearby holes in the power plane and one can perhaps not conclude that layout C is better than layout D because of this. Layout E shows the effect of using (overplated) via-in-pad. The result is significantly better than the previous layouts, especially for the bottom side. Less than 0.5 nH inductance on the top side and 1 nH for a capacitor on the bottom side is really good. In layout F, a more exotic reverse geometry 0306 capacitor is used together with via-in-pad. At first it looks really good with 0.3 nH on the top side and 0.7 nH on the bottom, but this layout has four vias instead of two and uses a more expensive part, so perhaps it should rather be compared with using two 0402 capacitors and then its performance is no longer outstanding. Layout G shows the effect of bringing the vias closer together. This has the most effect on the bottom sides where the current flows through a longer section of the vias. Layout H shows an 0306 used without via-in-pad. This does not give a significant penalty, so the benefit of via-in-pad is not dramatic when using 0306 components. Is it worth while using reverse geometry 0306 capacitors instead of ordinary 0402s? My conclusion is that using 0306 capacitors is rarely if ever a better choice. In all the 0306 cases tested here, the inductance was more than half the inductance of a corresponding 0402 layout, so by using two 0402s (which have the same number of vias and take up roughly the same area), the same or better results can be achieved. The 0402 alternative gives more layout flexibility in tight layouts since they can be placed separately in two smaller free areas, like in the middle of a 1 mm pitch via array under a BGA package (utilizing via-in-pad or suitable octagonal SMD pads). From a cost perspective it looks like 0306 also comes out short. A 1 µF, 10 V, 0402 with X5R dielectric currently costs about $0.011 at Digikey in quantities of 1000. The least expensive 1 µF, 10 V, 0306, X5R capacitor that Digikey currently stocks costs $0.13 in quantities of 1000, but they also list a 1 µF, 10V, 0306, X7R capacitor for $0.043. A few of them are in stock as I write this, but it is not generally stocked. It is however stocked at Mouser for $0.052 in quantities of 1000. So it seems like one 0306 costs at least twice as much as two 0402. The assembly cost can vary widely, but $0.01 per capacitor might be in the right ball park. In that case the total cost difference between one 0306 and two 0402 becomes smaller, but still hardly to the advantage of 0306. If you need high decoupling capacitance and operation above 85 °C, X5R dielectrics is not good enough and X7R or X7S (or better) should be used. Digikey has 0.68 µF, 6.3 V, 0402, X7S capacitors that cost $0.021 @1000. So with these requirements 0306 and 0402 might be more or less equivalent from a cost perspective. So typically it seems like a better idea to stick with traditional 0402 capacitors (and use twice as many) than to use 0306 since it gives better performance, lower cost and higher layout flexibility. Using (overplated) via-in-pad technology can give a 15-30% reduction in decoupling inductance for 0402 capacitors. The improvement is largest when the planes are close to the capacitor, i.e. when via inductance is a smaller part of the total parasitic inductance. Using 0306 capacitors gives lower inductance per capacitor (than using 0402 capacitors), but does typically not give lower inductance per via used, per $ spent or per board area used for decoupling. In the majority of cases it is better to use 0402 decoupling capacitors than to use half as many 0306 capacitors. Update: To test whether dual 0402s are actually better than a single 0306, I did some more measurements and wrote about them in a new blog post.